I believe in using tools. And if the tools are easy to use and free, so much the better. That's why I'm a big proponent of using templates. Templates are one of the best ways to save time, effort, and be sure that your documents are consistent when they need to be. Templates make life easier when you use them for letters, documents, brochures, etc. but they really make life easier when you use them for labels. The spacing for your label documents has to be extraordinarily precise to make sure that the text is printed exactly where it needs to be—I've tried making my own and while it's possible, it's really not worth it. It's not worth it because there are so many pre-existing templates to use instead. There might be a few sheets of labels somewhere without a corresponding OpenOffice.org label template, but they're rare. You can print on virtually any label sheets you want with the templates included in OpenOffice.org, and the templates from WorldLabel. 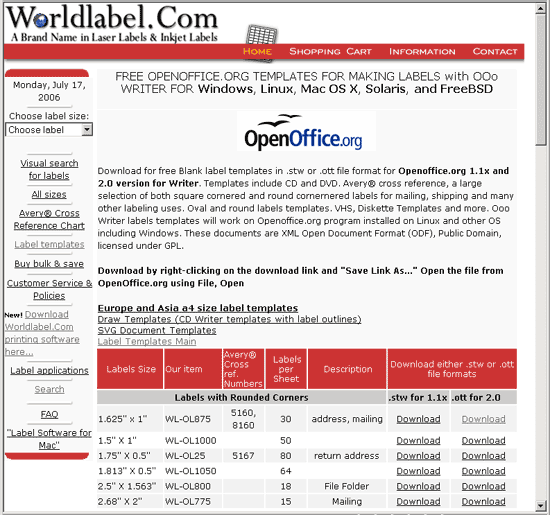 This article is about how to use the OpenOffice.org templates, in particular the WorldLabel templates, to print the labels you need. I'll talk about how to download them, install them, use them as they are, and how to customize them with graphics and other features. I'll also touch on how to use the OpenOffice.org label wizard; you can use the label wizard each time, or save the template you create in the same template repository with your WorldLabel templates. 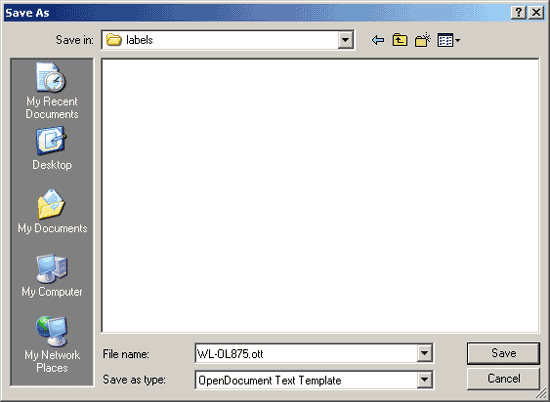 WorldLabel lets you download free templates in Word, PDF, and OpenOffice.org formats. For OpenOffice.org you can download label templates in .stw or .ott file format for Openoffice.org 1.1x and 2.0 version for Writer. You can look them up by the number on your Avery label sheet box or read the description. There's a huge number of templates including those for CD and DVD, video, mailing, shipping, and diskettes, and with square or round corners. The templates are XML Open Document Format (ODF), Public Domain, licensed under GPL. The first step, of course, is to get the templates onto your computer. First, make a directory where you're going to put them. Create a directory at C:\labels or /home/labels, for instance, though you can put them wherever you want. Next, go to the URL for OpenOffice.org templates. You'll see a list of templates. Find the one you want, by its corresponding Avery number (this is printed on your box of Avery labels), by the dimensions, or by the name if you know the WorldLabel name. To download the template, find the Download link, under the version you want. If you're using the current version of OpenOffice.org, use the Download link under the 2.0 version for .ott files. Then right-click on Download and choose Save Target As. When the dialog box appears, specify your labels directory that already made, and click Save. Repeat the downloading steps for any additional templates you want. This is available only if you want to use templates in the old version. If you want to download all the templates at once, scroll to the bottom and find this link. Click it; you'll go to another site. You'll need to click two or three more times on various icons that specify 1.0 labels, but you'll eventually see this. Right-click on it just as you did for the other links and choose Save Target As. Save the file to your labels directory. Once the file has been downloaded, right-click on the file in your labels directory and choose to extract the files.